A large fraction of women in the society admire Kendall Jenner for her magnificent hairstyles when turning up for different events. In fact, women look up to her for unique hairstyles for their hair. Well, look no further if you are still contemplating on the hairstyle to adopt for your beautiful hair. Below are some Kendall Jenner Hairstyles you can incorporate. Does your hair expend past your shoulders? If yes, you should check out this marvelous long hairstyle. As the name suggests, the center part medium length hair must have a partition on the middle head. This line ensures no hair crosses the other side once it is combed towards a specific direction. It can be towards right or left. The hair should be combed straight towards its combed direction. Afterwards, the hair combed on both sides of the head should be given a wavy look before being trimmed to be even in terms of length. Choose the Side swept haircut if you would like your head hair to remain within the head region. Some part of the fringe hair should be combed towards the left side head. It should be systematically combed to conjoin with some of the middle head and the side head hair. The hair on the left side of the head can extend up to the edge of the left part of the forehead. Moving on, all the hair combed towards the right side of the head should be combed towards the back of the right ear. This is one of the simplest Kendall Jenner’s hairstyles. Start off by blow drying your head hair. Thereafter, you should apply gel to give your hair a wet look. All your head hair, including the fringe hair should be combed backwards. Some section of the side head hair on both sides of the head should rest behind the ear. Above all, slick back wet hair look makes it easy for women to incorporate other hairstyles. Lastly, it is suitable for any type of hair. This is a very simple causal hairstyle, suitable for women with long hair. It is categorized by a bun towards the end of the middle head and the rest of the head hair being combed backwards. All the fringe hair should be combed backwards to conjoin with the middle head hair and some bit of the side head hair before forming a bun. Afterwards, the side head hair on both sides should be combed backwards, behind the ear. Make an effort of checking out this hairstyle. As the name suggests, this hairstyle focuses on giving women a shiny and curly hair. You can start off by blow drying your hair to give it softer. Secondly, divide your fringe hair into two sections. One section should be combed towards the right and the other one towards the left. The fringe hair on the left side of the head should rest towards the edge of the forehead. On the other hand, the hair on the right side of the head should rest behind the ear. Afterwards, apply gel on your hair before giving it a wavy look. This is a top notch Kendall Jenner’s hairstyle design. It focuses on making your head hair reach the shoulders. Your stylist should partition your middle head into two parts through a line. This line gives direction on the direction your hair should be combed facing. You are also encouraged to give your side head hair a wavy look, after combing it straight. Above all, you must ensure the hair on both sides of the head is equal in terms of length. Ever dreamt of incorporating both black and highlight dye on your hair? If yes, you should check out the Glamorous waves look. There should be a partition line to divide your middle head and fringe hair into two parts. Afterwards, the front view hair should be combed either towards the right or the left. The side head hair must have a mixture of both black and highlight color before being given a wavy look. Above all, the side head hair should only stretch up to the shoulders. It is characterized by long hair being combed towards the left side of the forehead, past the shoulders. Above all, the hair on the left side of the head should attain the bouncy curls look. There should be a line on the middle head to determine the direction the direction you hair should be combed. Hair on the right side of the head is a bit short when compared to that on the left side of the head. Try out the long hair with bouncy curls if you have long hair. As the name suggests, the Mohawk updo hairstyle aims at giving you a Mohawk look. Take some section of the middle head hair and fringe hair and comb upwards. Thereafter, conjoin them together to form a bump. The rest of the head hair should be combed backwards and conjoined together at the back to form a tail. Make an effort of trying out this causal hairstyle when going for one of your random outs. Mohawk Updo hairstyle can be attained within a few minutes. This marvelous long hair hairstyle incorporates both styling up and plaiting on the left side of the head. There should be a line from the fringe hair region that cuts into the middle head hair. The hair on the right side of the head should rest behind the right ear, whereas that on the left side of the head can extend up to the forehead. Above all, the hair on the left side of the head should be lengthy to pave way for plaiting. Plaiting should commence once the hair on the left side of the head has reached the neck region. This top notch casual hairstyle is characterized by the fringe hair and some section of the middle head hair being combed towards the cheek. Consequently, they are given a curly-wavy look when they hang towards the cheek. There is a line that separates fringe hair and some sections of the middle head hair into two parts. Moving on, the rest of the head hair should be combed towards the back to form a bun at the end of the head. Blow dry makes it easy to attain this Kendall Jenner’s hairstyle. Consider the Bouncy curly hairstyle if you desire your head to be filled with curls. This is definitely a causal hairstyle that suits any type of hair. Bouncy Curly hairstyle is characterized by hair on the right side of the head being combed towards the back of the right ear. On the other hand, the hair on the left side of the hair should extend from the left side of the forehead going sideways. Women with long hair should consider this hairstyle as it can be easily incorporated into other hairstyles. Anyone with a long hair can attain this hairstyle on her own. 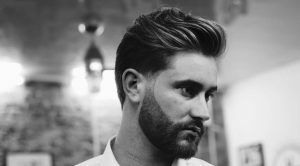 This hairstyle entails combing, trimming and blow dry procedure to make it soft. Soft hair is easy to comb backwards. Blow dry is the most efficient way of making your hair soft within a short period. Secondly, comb all your head hair towards the back of the head. The pushed back hairstyle must be uniform in terms of length when combed straight towards the back. Additionally, you can leave out some fringe hair to hang on the left side of the head. Consider the casual Side Braid hairstyle if you desire focus to be shifted on the left side of the head. The hair on the left side of you head should be lengthy compared to that on the right side. This makes it easy to plait the hair once it has been combed straight. Start off by dividing your front view hair into two sections. The hair on one section should be combed towards right and the other one towards left. Hair on the left side of the head can stretch up to the forehead, whereas that on the right side of the head should rest behind the ear. A messy looking hair is one of the trending hairstyles in our current world. Well, Kendall Jenner doesn’t disappoint with trends. The messy updo hairstyle is characterized by a zigzag line that cuts into the middle head. The zigzag cuts, unevenly distributes the hair in the two sections. Afterwards, any short hair on the head should be combed straight to give a messy look. Consequently, the top head hair should be combed into sections. Each section should be unevenly combed. This is the easiest way of achieving the messy updo hairstyle. In Side swept waves hairstyle, Most of the hair rests on the right side of the head. All the middle head hair should be combed towards the right side of the head. It should be combed straight to conjoin with hair on the right side hair. Some section of the middle head hair stretches up to the right side of the forehead. Afterwards, the hair should achieve a wavy look when approaching the neck region. The hair on the left side of the head is a bit shorter when compared to that on the right side and should not extend to the forehead. Consider this amazing hairstyle if admire the poker face look. Top knot with bangs is one of the few Kendall Jenner’s Hairstyles that encourage the growth of fringe hair. The fringe hair should be divided into sections while combed straight towards the forehead. The middle head hair should be combed towards right or the left side of the head. It all depends on their positioning. Hair on the back of the head should be combed upwards and tied in a knot form. It should be supported by surrounding hair to make it easy to achieve this hairstyle. Curls can enhance your look and make you more attractive. Retro curls hairstyle is designed for anyone who has long hair and desires to attain curls throughout the head. All the middle head hair should be combed towards the left side of the head. Afterwards, give your hair curls unto the hair length. You can incorporate highlight dye towards the edge of your hair. Moving on, the hair on the right side of the head should rest behind the ear before being given a curly look. The sleek ponytail hairstyle is only suitable for women with long hair. This is one of the simplest to achieve and easy to maintain hairstyles. Women are encouraged to consider blow dry before combing their hair. The Sleek ponytail hairstyle must have a ponytail that originates towards the end of the middle head. The ponytail should be combed backwards before resting on the back. You can add gel on your hair to give it a shinny look. Are you still contemplating on the hairstyle to adopt for your hairstyle? If yes, you should consider this hairstyle. The hair in this hairstyle is systematically decorated to form a bun look when approaching the edge of the middle head. Simply apply gel to all the head hair to make it easy to attain this hairstyle. Draw a partition line on the middle head hair. Afterwards, comb your hair backwards, in a systematic position. This is the only way to achieve a bun towards the edge of the middle head. Dark blunt bob hairstyle is considered both an official and a causal hairstyle. It is characterized by the side head being even in terms of length. Additionally, the hair must be pure black. Request your stylist to partition your front view hair into two sections. Each section should be combed towards the opposite direction. The hair on the back should be combed towards the back. Additionally, it should be trimmed in equal lengths with that on the side head. That’s not all; the side head hair should rest towards the back of the ear. Every woman has attained the slicked back hairstyle at some point in her life, isn’t it? Well, this is a very simple hairstyle. Simply start off by blow drying your hair to give it a soft texture. Thereafter, apply gel to separate the head hair to the point it looks like layers of hair on your head. Afterwards, comb your hair towards the back. This statement also applies to the side head hair. The applied gel helps keep the side head intact in one position. In conclusion, this hairstyle suits casual events. As the name suggests, this Kendall Jenner’s hairstyle focuses on giving your hair a wet and waxy look. The wet and wavy bob hairstyle looks good on anyone with long hair. Start off by deciding the direction your head hair will be combed. It can be towards the left side of the head or the right. Thereafter, you should give your hair a wavy look. It’s up to you to decide the length to incorporate the wavy look. In addition to all these, apply gel that makes your hair look wet. The bubble braid is a bit complicated as it entails adoption of different styles. First, divide your fringe hair into two sections. One section should rest on the right side of the forehead and the rest on the left. Proceed and partition a line that separates the middle head hair into two main parts. One side should be combed straight towards the right and the other one on the left. Most of the hair on the right side of the head should rest behind the ear. Lastly, systematically conjoin the back head hair to form a ponytail. Any woman with long hair should check out this top notch hairstyle. The center part long hairstyle incorporates both black and blonde color. However, the black color dominates this hairstyle. As the name suggests, the center part should be divided into two parts. The hair on the right side of the head should rest towards the back of the ear. On the other hand, the hair on the left side of the head should be combed straight. This is the reason hair on the left side of the head appears bigger than that on the right side. Add spice by giving your hair a wavy look. Sleek low bun is one of those hairstyles that perfectly fit any outfit. Consider this hairstyle if you desire an easy to attain casual hairstyle while deciding which hairstyle to incorporate. Start off by washing your hair with shampoo. Thereafter, carefully dry off all the water on the head before blow drying your hair. This gives it a smooth texture that makes it easy to comb all the hair backwards and twisting it to form a bun. This hairstyle is recommended for women, especially during summer. Long wavy hairstyle enables your hair to be aerated by fresh hair. This leaves it fresh and facilitates healthy growth. Choose a position on your middle head hair and draw a line to guide you the direction you will comb your hair. You should incorporate a bit of blonde color on the edges of your hair. Additionally, give your long hair a wavy look throughout the head. Choose the middle part straight hair today and give your hair a blend of black and blonde look. This hairstyle is only suitable for women with long hair. As the name suggests, it is characterized by a middle head and the fringe hair being divided into two main parts. Each section should be combed towards the opposite direction. You should consider this hairstyle because it is easily changeable to another different hairstyle. This hairstyle focuses on making the mid head hair appear very low. Sleek bob hairstyle is considered both a casual and an official hairstyle as it perfectly suits any outfit. The middle head hair should be divided into two and each part should be combed straight depending on the direction it is facing. The back head hair should also be combed towards straight. Additionally, the hair length on both sides of the head should be equal in terms of length. This causal hairstyle states that the head hair should be divided into two sections. One section should be combed towards the left side of the head. This part of the head is characterized with a wavy look that stretches up to the edges of the hair. Moving on, the head hair on the other side of the head should be plaited. This is a marvelous casual hairstyle and definitely worth trying out.